A son loses his mother. Our National Day of Mourning allows us to recognize, remember and pay respect to those who have lost their lives in the workplace. But so much more is needed. With work-related injuries and deaths on the rise we must step up and do more. 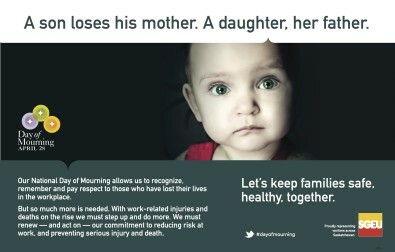 We must renew - and act on ó our commitment to reducing risk at work, and preventing serious injury and death. Letís keep families safe, healthy, together. Proudly representing working women and men across Saskatchewan.